A daily Trade Exhibition, of local Industry stakeholders, including interested Regional and International Practitioners. A daily Industry Panel, by Local, Regional and International Experts. Daily Showcase Performances, by exhibiting Musicians and other Talent, in front of Local, Regional and International Festival Bookers. WHAT IS ONGEA! MUSIC SUMMIT? ONGEA! 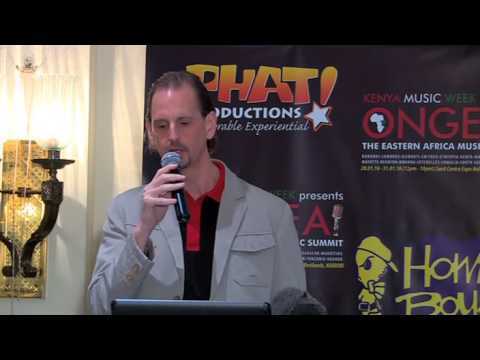 is Born out of our Annual KENYA MUSIC WEEK, which ran for 10 Years – every December, from 2004 to 2013. Since KENYA MUSIC WEEK achieved its Objectives for the Kenya Music Industry over that Decade, we are now Broadening the Scope of our Event – whose three Pillars are still Trade, Learn and Showcase. This Event will be held at Sarit Centre Expo Hall in Westlands, Nairobi – KENYA, from Thursday 14th to Sunday 17th February 2019. ONGEA! 2018 – The 3rd Eastern Africa Music Summit was held from Thursday 15th to Sunday 18th February 2018 at the Sarit Centre featuring 43 unique Exhibitors occupying 58 Exhibition stands. The Summit saw an increased participation of government institutions including Government offices, such as the Permanent Presidential Music Commission (PPMC), Kenya Copyright Board (KECOBO) and Kenya Film Classification Board (KFCB). For its knowledge transfer session; the summit had Over fifty (50) local & international Professionals, on ten (10) topical Industry Panels, attended by 12, 758 stakeholders over the four days. Industry practitioners such as Decimal Record’s Eric Musyoka partnered with the Summit to host two masterclasses on Music Production and the art of the Mix. Similarly, Mdundo, a music distribution service partnered with the Summit for its 4th edition of annual Mdundo Awards to reward artists with the most downloads on the platform in seven different categories, and saw some of Kenya’s leading music acts including Nyashinski, Khaligraph Jones, Mercy Masika, Willy Paul among others awarded. More than 29 bands and solo acts showcased for a chance to get booked to the various festivals including Germany’s leading club festival Reeperbahn and South Africa’s Music Conference KZN Music Imbizo now known as The Music Imbizo. An Open Mic Competition for two (2) Fully-paid Scholarships to Sauti Academy also attracted a huge turn out from aspiring music talents and was run through the partnership of Sauti Academy who judged and identified two outstanding acts. Artville Music operated the 2018 free demo recording studio for the second time in a row. With growing interest for the industry in Eastern Africa delegates from America, Austria, Djibouti, Ethiopia, France, Germany, Kenya, South Africa, Tanzania and Uganda were in attendance. The summit was made possible with the support of various partners and as we look forward to another exciting edition in February (14-17 February), ONGEA! shall make stops in various markets across the continent through the partnership of DISCOP Markets to explore the connection between the Music industry and key industries such as Advertising, film, Gaming and Television. The DISCOP Markets are scheduled for May 28-30 (Abidjan, July 11-13 (Zanzibar) and November 14-16 (Johannesburg).